Walking along a quiet, narrow street in downtown Madaba, Jordan in late September, I’m on my way to find a popular mosaics school. 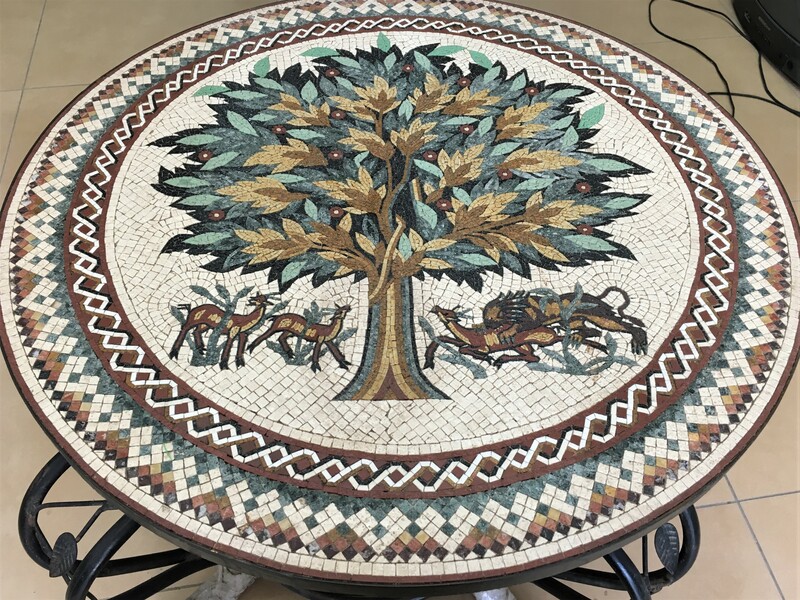 Much of the Middle East is filled with mosaic art dating back to the 3rd millennium BCE. 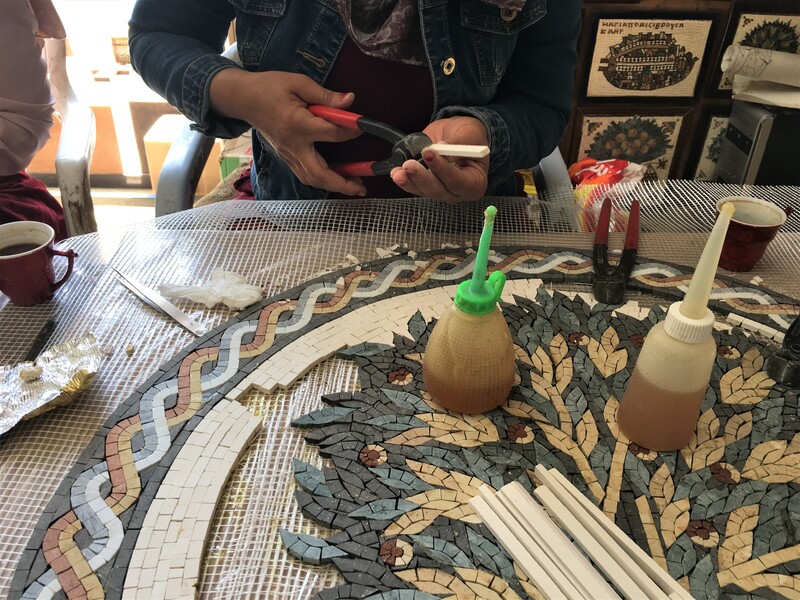 The small city of Madaba, just south of the capital of Amman, is home to perhaps the greatest number of mosaics in the world, including the famous Mosaic Map. I want to talk to the students who have studied this art of the past and are learning how to replicate it to sell in the country’s shops today. On the wall of a small building I see a sign for a church, with a narrow door beneath. I know this is not the school I’m searching for, but something about it strikes me as intriguing. I walk through the door into a small gift shop and from behind a wall to my right, I hear excited screams. Jamilah! Jamilah! Come! Come! I step around the wall to see a handful of beautiful, colorfully dressed young women enthusiastically motioning me into a room, where they are sitting around a large table. Jamilah! [beautiful in Arabic] Come! I will never know how they knew I was in this building. Not only did a wall separate where I had entered from where they sat, but I hadn’t passed by the windows which ran along the building, and no one had been outside when I was approaching. There was no way they could have seen me. I think this meeting is our destiny. At the table where they sit, long thin blocks of blue, green, red, white and yellow rock are scattered beneath their fingertips, atop a white mesh covering the muted colors of a painting of the Tree of Life. Across the room, three men sit at another large table piecing together a different mosaic. These people are mosaic artists, I realize, and this is their workshop. One of the women pulls out a chair, and all of them tell me to sit, so I sit. Their work table is piled with red clippers, bottles of orange glue, cups of coffee, phones, and hundreds of bits of multi-colored stones that they’re piecing into the Tree of Life. 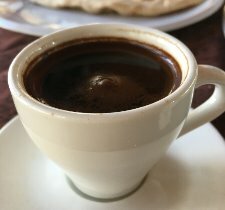 All of the women at the table where I’m sitting are Jordanian except for one, a sweet and pretty 20-year-old Coptic Christian named Mariana who has spent her entire life not in Egypt but here in Jordan. One of the three men across the studio is Jordanian, and the other two are Syrian. Fouad was also a mosaic artist back in Idlib, Syria before he fled from the war and Jamil, who later invites me to dinner with him family in his home, is also from Idlib. 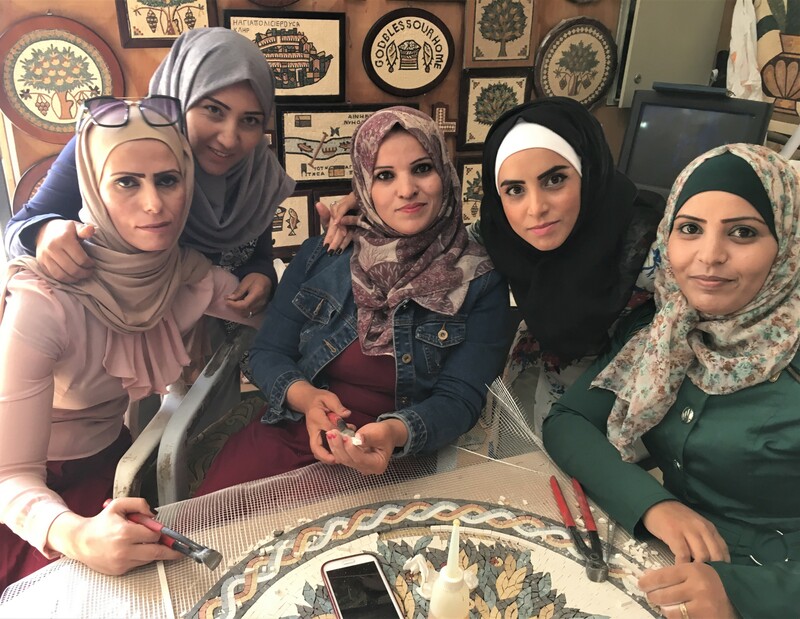 This mixture of people is not typical in the Middle East, or even in the world, but it is normal for Jordan. In this country and region where approximately 95% of the population is Muslim, Madaba has a higher-than-usual percentage of Christians. The war in Syria has resulted so far in at least 1.5 million refugees in Jordan, many in Madaba. 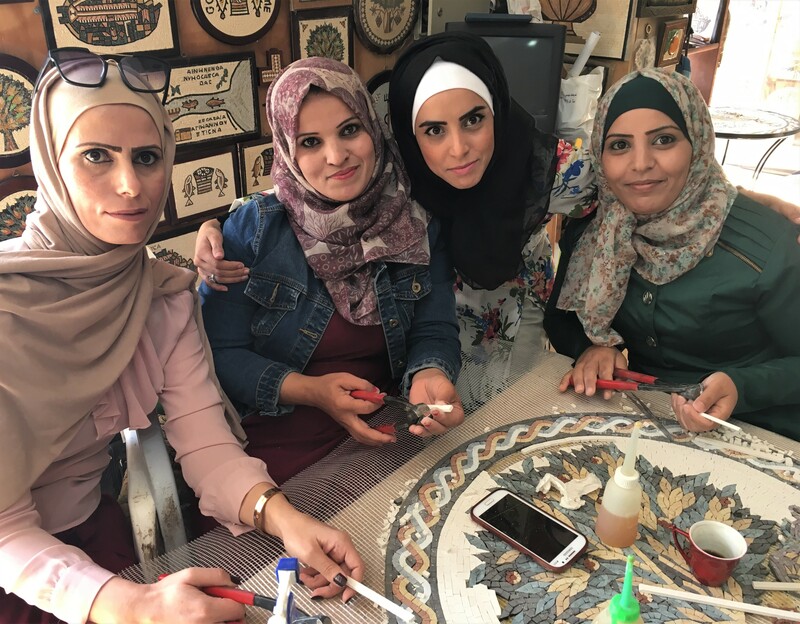 The people of these two religions and these two countries are usually able to live in peace in Jordan, and this little mosaics workshop is a perfect example of their friendship. All of these women are excited, all of the time. This is the happiest workplace I have ever experienced in my life. I feel good in this place. I end up spending many hours here on many days during my time in Madaba. The women are loud and love to have fun while they work, laughing and playfully spraying water on the quiet men across the room. The men laugh but do not spray back. They are lively and they are funny. But these women, like all Middle Eastern Muslim women, carry much of the burden of misconceptions about the people of the Middle East. Abla is a charismatic 35-year-old and the loudest of these lovely women. She is also a fast learner who eight years ago mastered mosaic making in one week. Like all of them in this little workshop, she will have nothing to do with the stereotypical image of a Middle Eastern Muslim woman, married, oppressed and miserable. Abla has never been married and doesn’t want to ever get married. “Marriage doesn’t have to be the first step in life,” she says. “Marriage is not the most important thing.” Abla doesn’t love the idea of getting married. But she does love creating mosaics, she loves to drive, and she can’t wait to buy a car. Khlood, with her sharp features and bright eyes, is lively and loud, like Abla. She’s 29 years old and also has never married, by choice. “No one is making us marry,” Khlood says of Jordanian Muslim women. 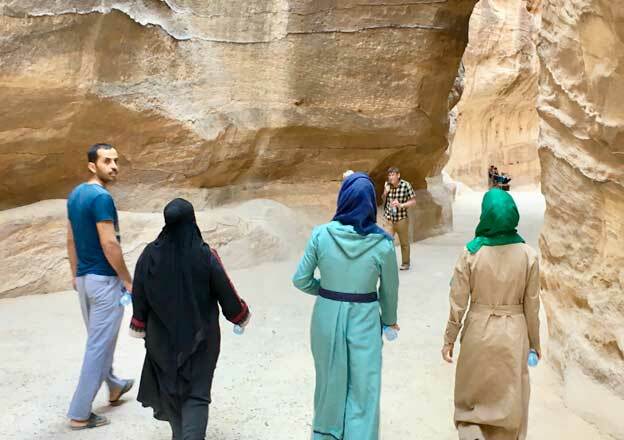 Khlood wants to dispel another common belief about Muslim women – that in the Muslim world the men tell the women that they must cover their heads by wearing a hijab. Khlood began wearing a hijab when she was 20 years old, because she wanted to; not because anyone told her she must. Hanna, a serious young woman working quietly amidst the talking and laughter, started wearing a hijab when she was 20 years old. It was her third year at university, and her family didn’t make her; no one made her. “It’s written in the Quran,” she says. As the days move by, two more women come into this mosaics workshop. Wesam, with her brilliant smile, comes to work and Nisreen, with her haunting eyes, likes to come and visit day after day, like me. The strong, bright Middle Eastern sun streams its way through the huge workshop windows, shining onto these people’s beautiful faces as well as the hundreds of mosaics which they’ve created and hung on the walls for people to buy. The bright and airy feel of the studio matches the lighthearted nature of these lovely people. All of these women with whom I sit are free. They’re strong, they’re full of life, they’re fun and they are beautiful. 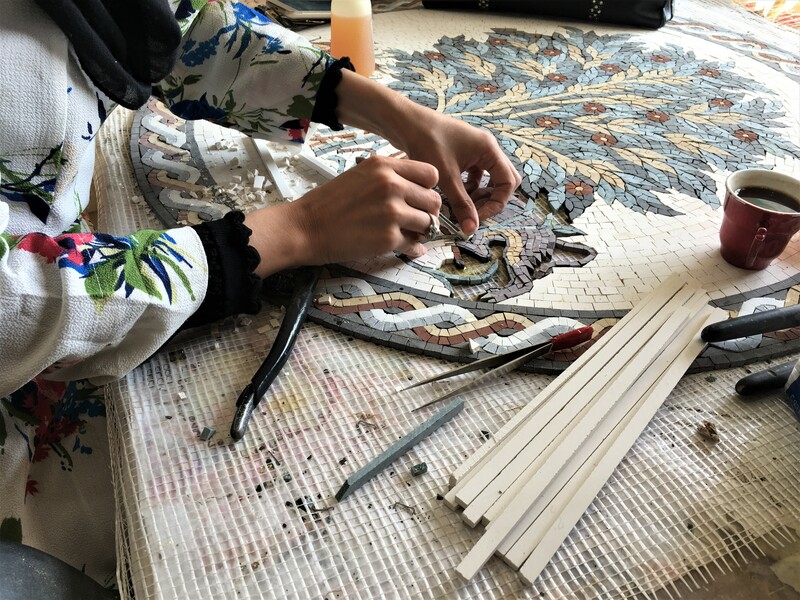 For them, mosaics are not just a job. They enjoy this art so much that when they go home for the evening, sometimes they make more mosaics. To spend your life every day working at a job you love with people you love, this is something everyone in the world wants. Everyone wants freedom, everyone wants happiness. All of us want a good life. And all of this is the reality of the lives of these Jordanian Muslim women.